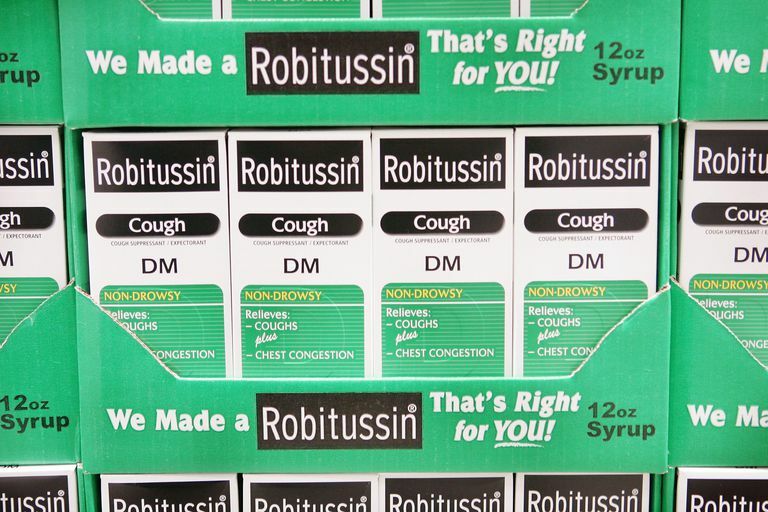 Robitussin DM is an over-the-counter cough suppressant and expectorant. This medicine helps to control your cough and thin secretions so it is more productive. It is widely available under the brand name Robitussin and the same medicine may be purchased as a store brand or in generic form. The ingredients in this medicine help to loosen mucus and suppress coughing. People commonly take this medicine for coughs associated with colds, allergies, the flu, and other respiratory illnesses. Robitussin DM and its generic counterparts contain dextromethorphan HBr 10mg, which is a cough suppressant, and guaifenesin 100mg, which is an expectorant. It should not be used in children under 6 without talking to the child's doctor first. Adults 12 and older - Two teaspoons every four hours as needed for cough. Do not take more than six doses in 24 hours. Children ages six to 12 - One teaspoon every four hours. Do not take more than six doses in 24 hours. Every medication has the potential to cause side effects. Most are minor and the benefits outweigh the risks. Do not use this medication if you are taking an MAOI (medication for depression, psychiatric, emotional conditions or Parkinson's disease) or for two weeks after stopping an MAOI. Ask a doctor before using this medicine if you have a chronic cough that is caused by asthma, smoking, or emphysema. If you have a cough that produces a lot of mucus, taking a cough suppressant can be problematic. Suppressing the cough can lead to secondary infections such as pneumonia because the mucus sits in the lungs rather than being expelled by coughing. Talk to your healthcare provider prior to taking this medicine if you are pregnant or breastfeeding as well. Do not give Robitussin or other cough suppressants to children under 6. "Robitussin Cough Product Labeling." Wyeth Consumer Healthcare 2007. Should You Use Delsym for Your Cough? Is NyQuil Right for You and Your Symptoms?